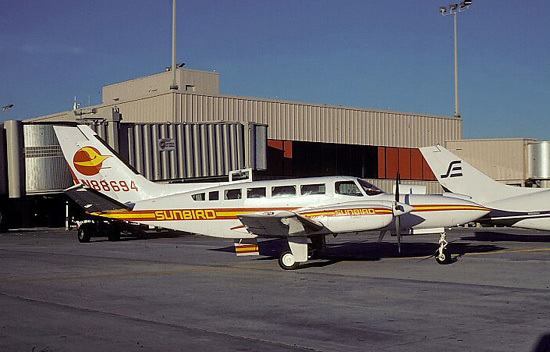 North Carolina-based Sunbird served several points in Georgia and Florida during the 1980s, including Atlanta, Athens, Savannah, and Jacksonville. The airline absorbed Atlanta Express in 1983. Sunbird became CCAir in 1986. Cessna 404 N88694 is shown at the commuter airline gate at Atlanta Hartsfield International Airport in 1980. In the background is a Southeastern Commuter Airlines Riley Dove. 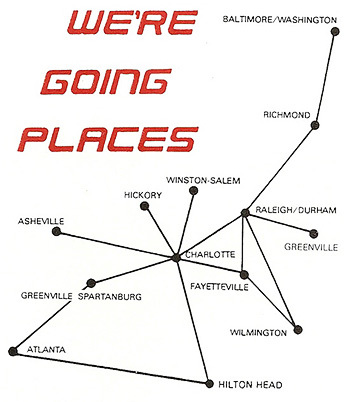 Sunbird Airlines route map from October 1, 1983. For additional timetable images and information, visit the Sunbird Airlines pages at Air Times and Timetable Images.